Sunny Valencia at the Spanish Costa del Azahar is not only known as the birthplace of the famous dish paella, it is also the homebase of the sympathetic seeds company Sweet Seeds. Sweet Seeds is known for its amazing line of autoflowering and feminised cannabis varieties. It was back in 2005 that Sweet Seeds found a homebase here for its cultivation facilities and test centre for her team of passionate and dedicated growers. The genetics and the varieties they created were very well received and Sweet Seeds quickly gained an international reputation in the world of weed seeds. Sweet Seeds believes it is important to focus on the genetic quality and the yield of the plants. All feminised cannabis seeds produce female plants and have a germination percentage of 99.9%. Sweet Seeds is searching for plants with an outspoken taste and aroma which also produce a lot of resin. Connoisseurs will certainly be able to appreciate the distinctive aroma of the Sweet Seeds varieties, regardless of whether it concerns a fruity, an aromatic or an earthy taste. One of the accomplishments of the Sweet Seeds team is the development of a new, special line of cannabis genetics, the so-called “red family” including types such as the Red Poison and the Dark Devil. One of the latest additions to the Sweet Seeds catalogue is the F1 line containing fast versions which are specifically intended for the most impatient ones amongst the growers of cannabis. Sweet Seeds offers a range of more than 30 different varieties that are all autoflowering and feminised types that have been created after thorough investigation and research by our team. These varieties have meanwhile achieved more than 80 awards at several international cannabis competitions and harvest festivals. The experienced grower, the commercial grower, the hobby grower and the starting cannabis grower will all definitely find a type to their liking in the assortment of Sweet Seeds. The development of and the research into new types continues even today so new and innovative varieties will be regularly let loose onto the world, also in the future. The selection of the genetic material used and the seeds sold is one of the key strengths of Sweet Seeds. The selection process takes place in a cautious manner and is done entirely manual. One by one the weed seeds are selected and all have to successfully pass the technical check before they are approved and packed. The cannabis seeds are packed and stored in a special, cooled climate room with low humidity and ideal conditions. This ensures an optimal storage and the seeds will maintain their germinating power and freshness. Moreover, all packed seeds have successfully passed a germination test during which at least 95% of the tested seeds germinated. 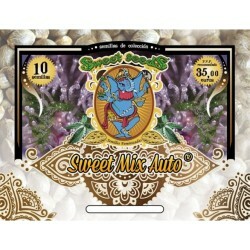 As a Spanish seeds company, Sweet Seeds has received recognition during multiple cannabis cups at the Iberian continent. This also includes the awards for best seed bank that were issued on Expocannabis and Spannabis in 2007, 2008 and 2013. The juries of the different cups specifically appreciate the outspoken tastes and aromas. Some varieties even received several nominations in multiple categories. Some of the award-winning Sweet Seeds varieties are familiar names such as: Highlights Jack 47, Black Jack. The Cream Caramel alone won more than 17 awards and endorsements. Further, the other award-winning types such as the Ice Cool, the Sweet Tai, the Wild Rose and the Green Poison are types that are also worth mentioning. Convince yourself of the potency, the delicious taste and the special aromas of the cannabis grown with the Genetics of Sweet Seeds; you will definitely not regret it.